It's day 29 of The 31 Day Nail Art Challenge and today's challenge is Inspired by the Supernatural! I wasn't sure what I wanted to do to my nails, but for a while now I've wanted to do a smoosh mani for the longest time. I know a foggy scene in any movie is perfect for anything scary and supernatural, so this was the perfect time for a smoosh mani. I painted my nails with two coats of Beyond the Nail - Gravestone. While that dried, I painted around each nail with NailExperiments - Easy Peel Latex Barrier. 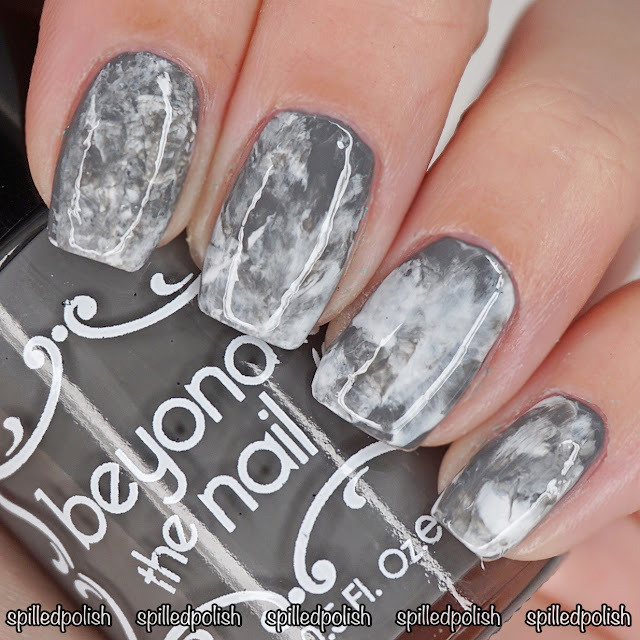 When it was dry, I got a stamper and dabbed on blobs of Beyond the Nail's Bright White & Gravestone and stamped it all over my nails, which created this smoosh look. I peeled away the latex barrier and finished each nail off with one coat of PRO-FX - Quick Dry Topcoat.